In 2017, the Aetna Foundation selected BikeWalkKC as one of 25 nonprofit organizations in 14 states for its Healthy Communities Initiative. This initiative was designed to address critical factors that impact social determinants of health. Through the 18-month project, BikeWalkKC worked with our evaluation partners, Children's Mercy Kansas City, to deliver youth education at four elementary schools, as well as hands-on built environment interventions, to improve community health in the historic Northeast KCMO neighborhood. This grant enabled us to lay groundwork for more effective programming, increased community partnerships, and improved evaluation across the entire region in the future. We designed this site to provide project updates as the grant period progressed, and to announce results once evaluations now that evaluations are complete. The project was led by BikeWalkKC, with evaluation support from Children's Mercy Kansas City. Funding for the project was made possible by the Aetna Foundation's Healthy Communities Initiative. The programs were administered to school children to improve awareness, skills, confidence and motivation in participants to walk and bike to school. Students learned basic bicycle mechanics, advocacy, and safety skills, and had the opportunity to earn a bike of their own. Arrival and Dismissal reports were used to determine policies, circulation discrepancies, and physical barriers that inhibit walking and biking to school. These evaluations, with resident and stakeholder feedback, will inform “quick-build” paint-to-pavement projects. These projects helped residents envision how permanent improvements make their community safer and healthier, and empowered them to advocate for such improvements. This project included an extensive evaluation process to assess the long-term impacts of the BLAST and EAB programs as well as implementations. Our research and evaluation partners at Children’s Mercy Kansas City helped collect and analyze data, and evaluate the impacts on the cultivation of long-term health and wellness of the residents. With support from the Aetna Foundation, we used a multi-layered evaluation approach, combining objectively and subjectively measured assessments, and utilizing new tools such as wearable GPS and accelerometers. 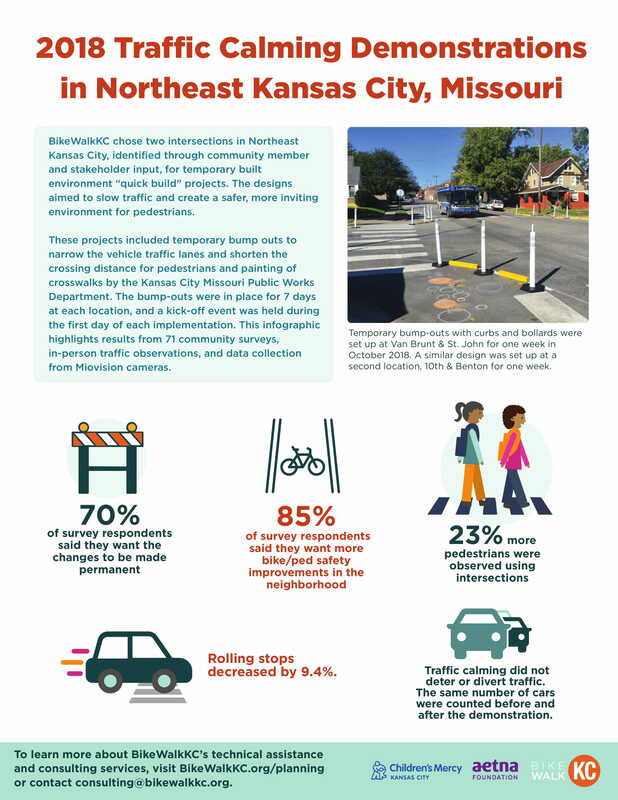 Residents, students, and community stakeholders were engaged, trained, and empowered to advocate for projects, programs, and policies that support improvements to the built environment, remove environmental barriers, and encourage to walking and biking in Northeast Kansas City. Want more information about the Aetna Project? 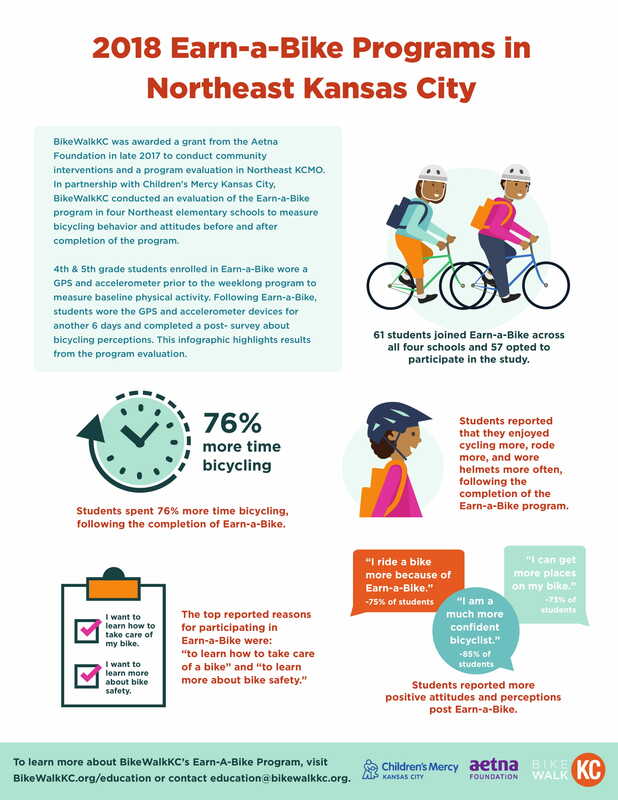 Contact us at education@bikewalkkc.org or 816-205-7056.